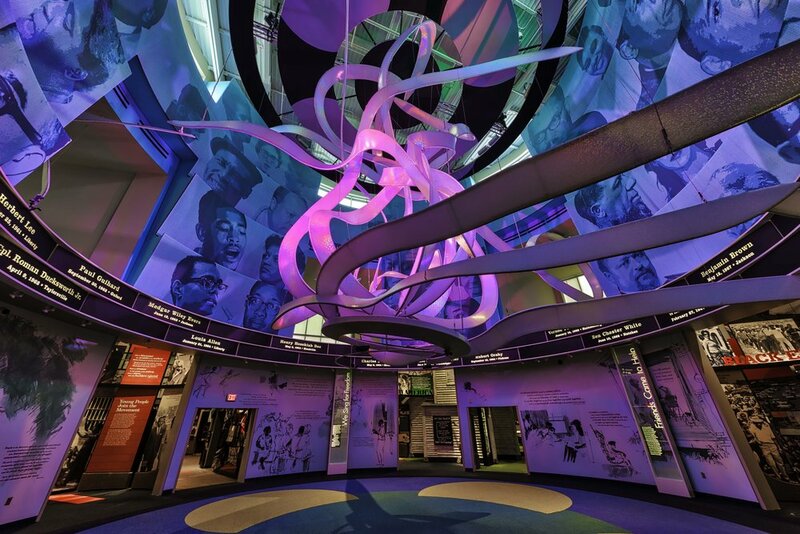 The Mississippi Civil Rights Museum shines a light on the heroic struggle of the Civil Rights Movement and provides a venue in which all Mississippians may come together to engage in public dialogue that fosters reconciliation, promotes healing, and illuminates a common path moving forward. This 17,000 sq ft exhibition is part of the nation's first state-sponsored civil rights museum. Hlferty led the exhibit design and managed a variety of partners to implement the impressive exhibit fabrication and AV elements. Visitors witness the freedom struggle in eight interactive galleries featuring a wide range of dynamic images, structures, artifacts, and audiovisuals including lighting, sound, video, and touchscreens. Seven galleries encircle “This Little Light of Mine,” a dramatic interactive three-story sculpture meant to inspire contemplation and hope. The sculpture’s technology senses and responds to visitors, with singing voices swelling from a duet to a choir, as lights move across graceful spirals. The central gallery of the museum holds, "This Little Light of Mine," an interactive sculpture animated by light and sound. The sculpture responds to the number and movement of visitors gathered within the space. The museum features challenging content and themes. Hilferty worked closely with museum staff to craft this unflinching look at history. 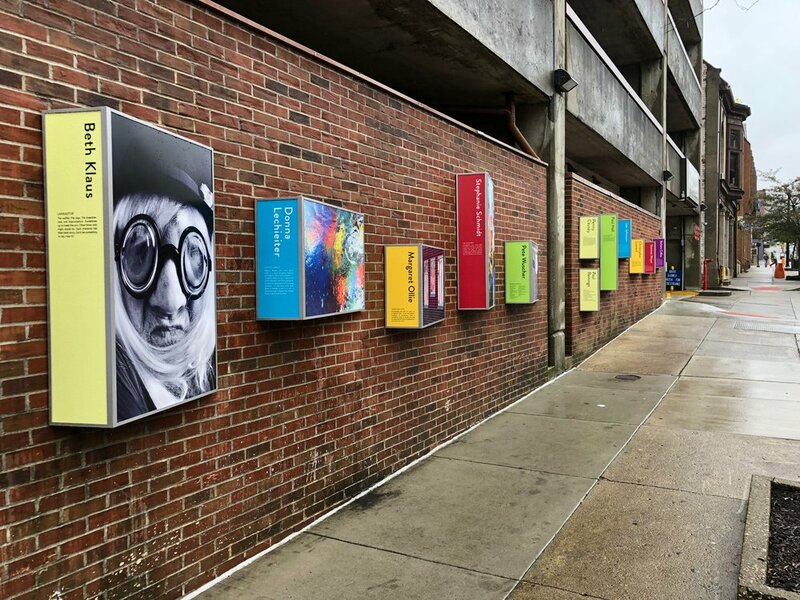 Galleries feature a variety of dynamic graphics and interactive elements. This multi-taction table allows several visitors to interact with a survey that measures and compares your reaction to life in this era with other visitors in the museum. 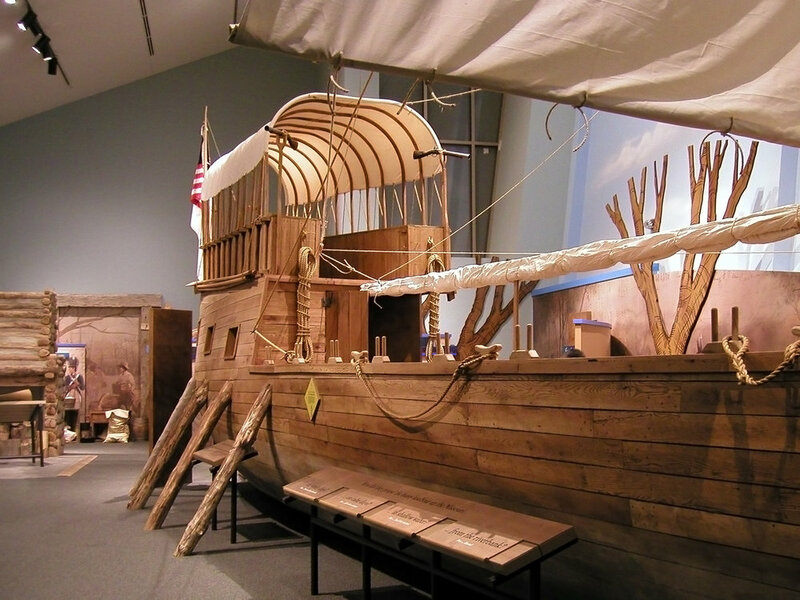 Dynamic graphics, artifact displays, and interactives draw visitors into the history. An immersive theater about the segregation of education is set up as a classroom for African-Americans on the left and white students on the right. The chalkboard transforms into a film screen as the lights dim. Immersive sound and lighting effects pull the visitor into the story. Innovative design incorporates a variety of settings into sharing the history throughout the galleries, including a jail cell, paddy wagon, train car, and church. The dynamic graphic design is influenced by the physical presence of the Civil Rights movement. These severe diagonal lines are inspired by the movement of figures in historic photographs. These lines are echoed in the architectural design of the museum building. The museum contains eight galleries with distinct design elements and themes, including fonts, colors, and graphic treatments. All are unified by larger universal aesthetics to create a consistent and impactful visitor experience. After Ohio’s grand statehouse was meticulously restored to its pre-Civil War grandeur, the Capitol Square Review and Advisory Board commissioned Hilferty to create a plan for greeting visitors and interpreting the history of the building, of Ohio, and of the state government. This plan had to follow the preservation guidelines of a unique space featuring many design challenges, including dense vaulted masonry located in the lower floor of the historic statehouse. Our dynamic design engages and informs visitors through a series of elegant multi-media presentation areas and interactive exhibits which explore the branches of government, how bills become laws, and a the “balance the budget” game. Hilferty recently unveiled phase three of the exhibits, called the “Heart of Democracy,” which is comprised of quotations on the following themes: We the People, Democracy, Equality, Inalienable Rights, Knowledge, Justice, Tolerance, Liberty, and Participation. The dynamic exhibit design makes the most of the unique historic space beneath the Ohio Statehouse. The challenging architecture becomes a platform for design from floor to ceiling. Visitors see themselves through graphic figural representations and follow a line of stories of important individuals in Ohio history throughout the exhibit space. How do you cast your vote? Interactives allow visitors to consider and share their stance on today's issues. Leaders from across the state of the state of Ohio are represented in a variety of AV and interactive displays. Visitors interact with economics, testing their hand with the state budget. 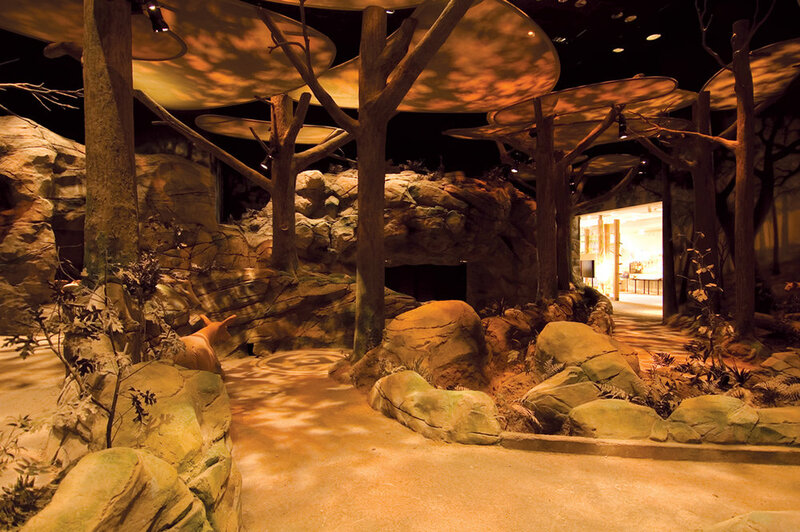 A variety of unique spaces and historic architecture allowed Hilferty to create a unique plan for exhibit design and visitor flow. Several styles of interactive kiosks are used throughout the exhibit. A rendering of a potential future phase of exhibit development, projecting dynamic images and animation on the vaulted masonry ceiling. The “Flint Hills Story” overview exhibit traces the story from multiple perspectives. Overhead, images projected within the domed ceiling feature scenes of nature highlighting the beauty of the region. Exhibits use artifacts, documents, video, and multimedia to develop a multi-layered understanding of the ecology, history, and natural beauty of the region, starting with geologic time and concluding in the present. The immersive theatrical experience is multi-sensory allowing visitors see, hear, and feel the power and beauty of the Flint Hills. Hilferty collaborated with Donna Lawrence Productions to create an immersive, 4-d multi-sensory theatrical experience, allowing visitors see, hear, and feel the power and beauty of the Flint Hills. A dynamic projection grows and responds to the imagery on screen. The Flint Hills Discovery Center was designed to be an attraction to the region, welcoming community members and visitors. The history of the Flint Hills region is told through a variety of artifacts and graphic design from map treatments on the museum floor all the way to a domed ceiling featuring an expansive prairie sky. 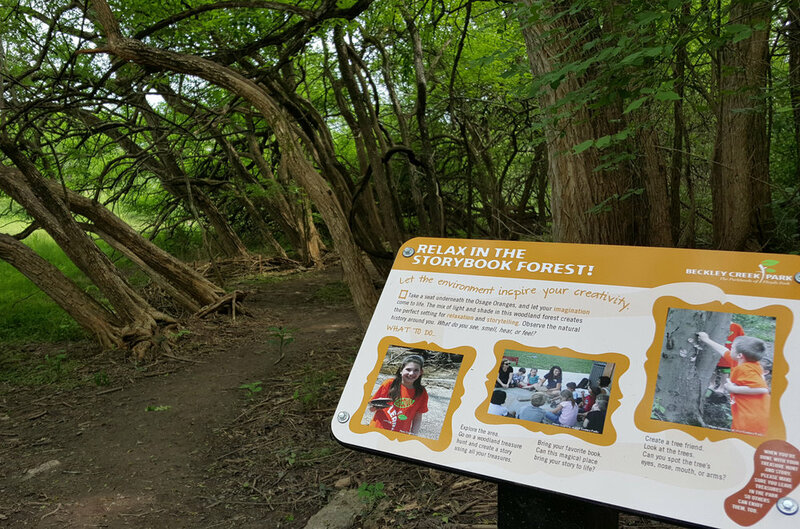 Family friendly areas are designed to allow children to explore and learn through curiosity and play. “Don’t Fence Me In” documents the story of the first ranchers and farmers to the Flint Hills. 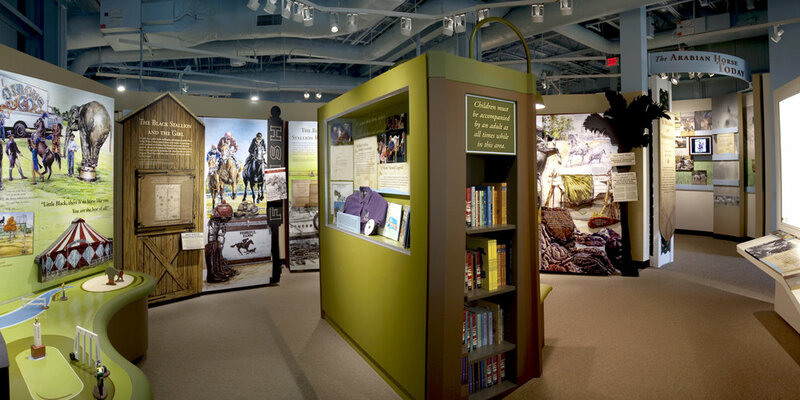 The exhibit invites visitors to try their hand at lasso knot tying or sing along with cowboy crooners.The history of the Flint Hills region is told through a variety of artifacts and graphic design. In the “Tallgrass Prairie: Tides of Time” theatrical presentation visitors experience the ferocity of a prairie fire, the pounding might of a migrating bison herd, a foggy morning on the prairie, a blinding snow storm, and the beauty and furor of an approaching thunderstorm. 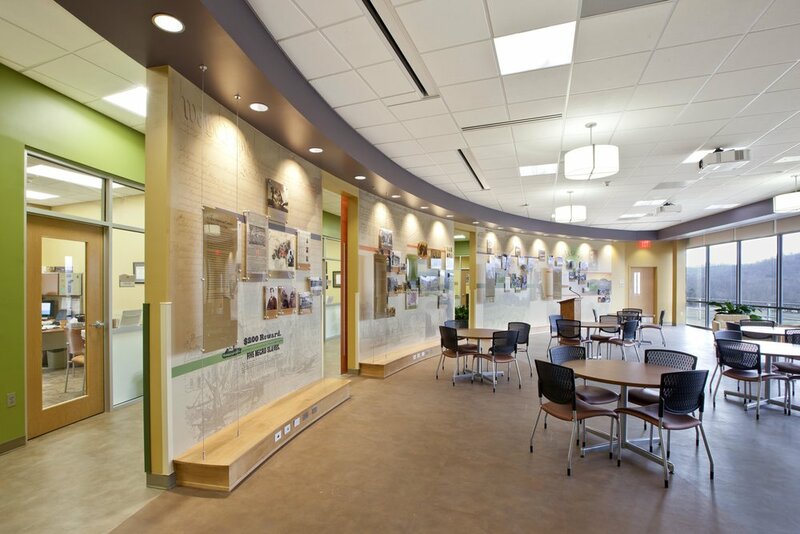 Innovative design allows visitors to learn about the prairie landscape in new ways. Seeing below ground exposes an extensive plant root system that is an integral part of plant health in the “Underground Forest” gallery.